The World Business Council for Sustainable Development (WBCSD) is a global association of some 200 companies delaing exclusively with business and sustainable development. The Cement Sustainability Initiative (CSI) is a global effort by 22 major cement producers with operations in more than 100 countries who believe there is a strong business case for the pursuit of sustainable development. Collectively these companies account for about one third of the world’s cement production and range in size from very large multinationals to smaller local producers. Cement is made by heating limestone in a kiln. The resulting material, called ‘clinker’, is then ground with blending materials into a powder to make cement. It is energy intensive, and the chemical process of making clinker produces CO2. These two factors mean that the cement industry produces about 5% of global man-made CO2 emissions, of which 50% is from the chemical process, and 40% from burning fuel. Cement facilities are capital intensive, and many options for CO2 reduction are expensive. The economics of CO2 reduction are affected by the cost associated with emissions, and the policies that would be in operation after the Kyoto agreement, from 2013 onwards. Any action taken now therefore requires a good understanding of the predicted costs and benefits in different future scenarios. Many people and organisations have commented on the possible value of a Sectoral Approach. For the CSI, this involves organised action by key producers and their host governments, to address the greenhouse gas emissions from their products and processes, within the UNFCCC framework. However, the CSI still did not know how well this might work compared to other policy options. To test these concepts and to understand the industry’s future options, the CSI needed an economic and policy model, coupled with stakeholder dialogues, to better understand the potential benefits and pitfalls. Under the direction of CSI’s management team and their environmental consultants ERM, Paragon developed CSIM3, a business model of the world cement industry. The model was designed for use by business managers in CSI and member companies, and each user is able to see the model outcomes (production, emissions, materials consumption, costs and trade effects), suggest new scenarios and provide views from different areas of the industry. The base case divides the world into eight regions and includes data on production technology, shipping, energy, CO2 abatement options, costs, and many other factors. The model first determines the amount of energy and materials needed to produce one tonne of clinker. 1. Alternative Fuels are used to provide the energy needed in the production process. The use of alternative fuels, e.g. scrap tires and biomass, aids CO2 abatement and reduces waste. 2. 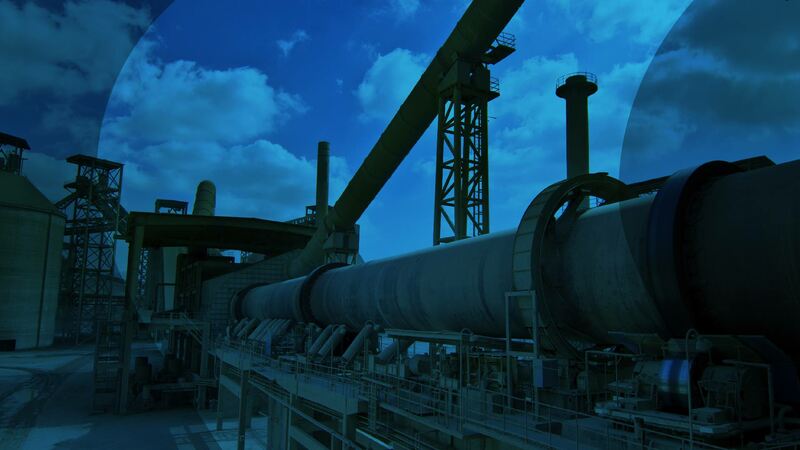 Alternative Blending Materials are used to reduce the proportion of clinker needed to make cement. This has multiple benefits, reducing both the fuel used and CO2 produced, and reduces the costs of production. 3. 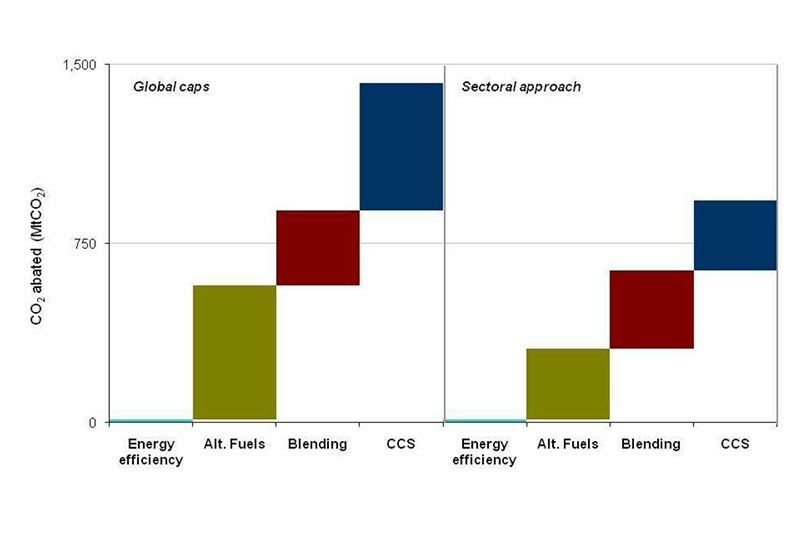 The take-up of alternative fuels & blending materials is dependent on their cost, availability & suitability, which are taken into account by CSIM3. Using a marginal analysis, it calculates a regional cost, including CO2, and then considers the costs and benefits of abatement, such as: improved energy efficiency, the use of alternative fuels, the use of alternative blending materials, and carbon capture and storage (CCS). Regions seek to meet domestic demand and may then export to other regions where it is profitable to do (subject to cost of production, price in export market, transportation and tax costs, and any trade restrictions). Carbon policies and emission goals are modeled across each region over time, and CSIM3 includes in the Marginal Abatement Cost analysis the costs of production and trade. Each scenario takes between one and 15 minutes to run depending on complexity, and over 200 scenarios and sensitivities were considered during the course of the project. These were distilled down to a concise but broad-ranging set of possible post-Kyoto policy commitments, based on a mix of no commitments, absolute caps and emissions efficiency goals. Cement production is expected to more than double by 2030, but a sectoral approach could reduce cement sector emissions significantly. There is relatively little potential emissions reduction from energy efficiency gains as modern plants are approaching the limits of minimum energy use and older plants are being retired. CCS is likely to have a strong role in reducing the sector’s emissions, but that substantial investment is required to make it commercially viable. 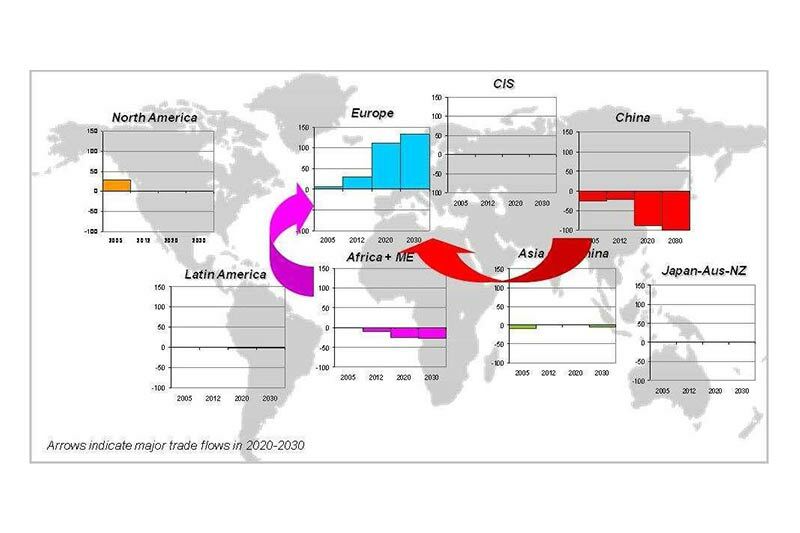 Potential trade distortions caused by regional carbon policies can be managed by one or a combination of tools including allowance allocation policies, border carbon adjustments, import/export tariffs and rebates. Exploiting the full potential of the sectoral approach requires supporting government policies in the participating countries, covering cement standards, building codes, and waste management practices among other areas. CSIM3 revealed the relative contribution to CO2 reductions that could be made by different abatement options. It showed that a combination of international cooperation and appropriate national policies provided the most promising route to maximise CO2 reductions but viable alternatives were available. The flexibility and speed of analysis of CSIM3 has enabled CSI management to consider numerous scenarios and sensitivities, and provide a quantitative analysis as the basis for stakeholder engagement. Model results will be used to inform the impact of international climate change policies on the cement industry, on the route to agreement at COP15 in Copenhagen in 2009. The model will continue to be used beyond COP15 as new ideas are presented, and new technologies developed. CSIM3 has been reviewed by some of the foremost thought leaders in CO2 reduction strategies and is considered to be leading-edge. One of the peer reviewers: “This model has been developed with a high transparency, and will contribute to the discussions on emission reductions and cost.” Howard Klee, CSI project director, states: “This project is difficult, in a complicated industry and at a challenging time. This project sets the bar high and will leave its mark in the energy and climate arena.” But perhaps the most important outcome is the confidence given to CSI that sectoral approaches can contribute to sector emissions reduction; Klee comments: “Modelling different approaches, we found that global CO2 emissions might be reduced by as much as 25% under this sectoral approach, compared to a situation where there are no commitments”. No economics-based analysis on this scale has been developed before and there is considerable interest in applying its innovative approach to produce solutions for other energy- and CO2-intensive sectors, such as steel, aluminium and utilities. A detailed report on the model scope, inputs and results is available on the CSI website, www.wbcsdcement.org/sectoral.